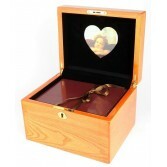 Here at the Cremation Urns Company we are proud to say that we still make many of these caskets ourselves, and whether you choose a traditional ashes casket or a jewellery box style ashes casket, you can rest assured that it will be a beautiful tribute to a loved one. 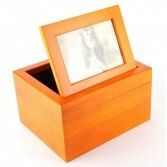 The Kingston Ashes Casket is a stunning wooden ashes casket of the very highest quality. It has an amazing high gloss finish with a photo frame as part of the lid which can be laid flat or placed in an upright position. The Kingston is also lined with luxurious velvet.